With a lot of curiosity and an only slightly smaller amount of skepticism, I last month accepted an invitation to a vertical tasting of Prosecco, a wine that is usually drunk young and fresh. The producer so bravely putting himself and his wine on the line was Primo Franco, owner of the Nino Franco winery (Nino was his grandfather) in Valdobbiadene, the heart of the heart of classic Prosecco country. I knew his wines to be excellent examples of the breed, with charm and elegance and fruit and an ever-so-slight hint of sweetness in the finish – lovely Proseccos, all of them, and I and a lot of other wine professionals regard his Prosecco Rustico as one of the best bargains in sparkling wine of any kind from anywhere. And since I also knew him to be a serious winemaker, devoted to the highest standards of quality in the field, the cellar, and the bottle, my curiosity easily trumped my skepticism, so there I sat waiting to taste library samples of his Prosecco Primo Franco DOCG 2013, 2003, 2000, 1997, 1995, 1992, and 1989. Seeing the projected lineup of wines, my skepticism had a little resurgence. 2003 was a wet, wet year all over Italy, and disastrously so in some regions. 2000 was hot, very hot, everywhere, producing a lot of wines that feature both over-ripe fruit and under-ripe tannins – not the best combination for a sparkling wine of elegance and charm. 1997 was superb in Tuscany, OK in Piedmont, and not so good further to the northeast. ’95 I couldn’t really recall, but I was pretty sure that ’92 hadn’t made distinguished wine anywhere. 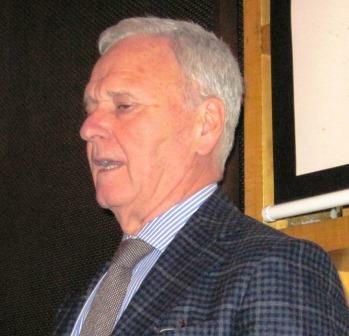 All these forebodings were reinforced by Primo himself, who in his preliminary remarks said that all the vintages he was showing had been very difficult – too hot or too cold, too wet or too dry – and (this confounded me) they had been chosen to be shown after he had tasted through some 30 consecutive vintages in his own cellar. We have got here, I thought to myself, either a brave man and a master winemaker or a complete lunatic. An hour later, it was very clear he wasn’t even a partial lunatic. So here’s the short story: The 1989 was a little disappointing, showing a perceptible tad of oxidation – not a bad wine by any means, but a come-down from the superb standard that had been set by the other six vintages. Primo felt this was bottle variation: “Not the best bottle of this vintage” he had tasted recently, he said. This is first-class winemaking, and a superb demonstration of the potential of the Glera grape (it used to be called Prosecco) in the right soils under the right hands. Several of the tasters, and Primo Franco himself, noted similarities between Glera and the great Chenin blanc wines of the Loire. There, Chenin yields wines dry and sweet, still and sparkling and capable of great age, as does Glera in Valdobbiadene. Alas, the comparison doesn’t end there, because both varieties and regions are esteemed by experts but largely underappreciated by the general public. More makers of Primo Franco’s quality, offering more such graphic demonstrations of their wine’s greatness, should change that. I just spent almost two weeks in balmy Belize, which is why this post is a little later than it should be. Picture this: Diane and I are deep in the tropical rain forest, getting as far from the wintry tundra of New York as we can. We’re staying in what Italians would describe as a rustico elegante lodge, Chan Chich, built into the plaza of an unexcavated Mayan temple complex in the middle of almost 300,000 acres of unspoiled jungle. We’ve been out birding all day – and what birds! Red-lored parrots and Ornate hawk-eagles, Tody motmots and Violet-crowned hummingbirds – in the steamy heat; still dripping sweat, we’ve taken refuge in Chan Chich’s cool, comfortable bar, scanning the drinks list for something that will lower our body temperature and that wouldn’t, in New York, be served with a tiny umbrella. The wine list is a sea of Chilean and Argentinian Cabernets and Malbecs – definitely not the drinks for the tropics – and the prospects don’t look bright, when what to our wondering eyes should appear but a truly rare bird, a solitary Prosecco. Not from a producer we’ve ever heard of, but a recent vintage, and definitely the wine for the moment. A few of those moments later – well, probably more than that: everyone moves at island tempo in the heat – a well-iced bottle appears, two frothy glasses are poured, two eager hands lift them, two eager mouths taste, and four lips almost simultaneously exhale a satisfied “Ahhh.” That Prosecco was good – Say “gooood,” the way the Latino soccer broadcasters say “gooooal!” Light, mildly citrusy, just a touch mineral, absolutely cleansing to the palate, and totally, totally refreshing. It was simply, uncomplicatedly enjoyable in a way that, in those circumstances, not even Champagne could be: The perfect wine in that place and time. Now I’m not saying that you have to hie yourself to the rain forest to enjoy Prosecco. One of that wine’s chief charms is that you enjoy it any time, any place: It defines informality. Yes, it is still real wine, and sufficiently complicated that you can subject it to a thorough organoleptic analysis, if you’re so minded. But why would you be? If ever a wine invited to immediate enjoyment – analysis later, if at all – it’s Prosecco. Like all seemingly casual things, that ease and informality results from hard work and great care. Italian winemakers at their best never forget that the highest art is to hide art, to make it all look and taste easy, as if it were inevitable. Prosecco is a perfect example of that. 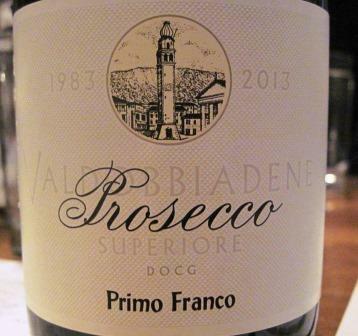 The best Proseccos come from a very small zone in north-eastern Italy with a jaw-breaking name: Valdobbiadene. (val-do-BYA-de-nay.) It’s a DOCG, indicating the nation’s highest wine classification. 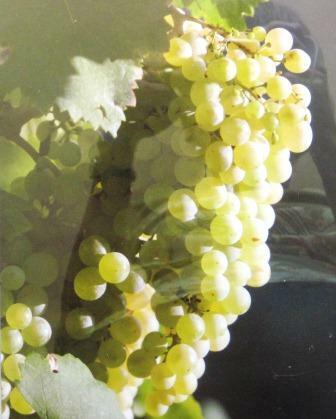 As so often in the great treasure house of wine varieties that is Italy, Prosecco’s grapes are specialized and local: a minimum of 85% of Glera (a grape that until recently was called Prosecco: more about this below) and a maximum 15% of a handful or other regional specialties – Verdiso, Bianchetta, Perrera or, for the Spumante, Pinot or Chardonnay. As “for the Spumante” implies, Prosecco can be made as a still wine, but the vast majority of it, some 90%, is vinified as a dry or nearly dry Spumante. A little reminder: Don’t confuse that with Asti Spumante, a bubbly wine vinified from Moscato in a completely different zone, and always sweet. Spumante simply means sparkling; it says nothing about dryness or sweetness, much less about the grapes the wine is made from. Because until recently the grape variety was called Prosecco, you can get wines labeled Prosecco from several other places than Valdobbiadene – the Veneto for instance. There’s nothing wrong with them – many are quite nice, in fact – but the best sparkling Proseccos originate in Valdobbiadene. Indeed, within that small island of an appellation there is an even smaller islet that is regarded as the crème de la crème of the zone: Cartizze. Thoughout the whole zone, the Glera grapes can be cultivated between 50 and 500 meters above sea level, and only on south-facing hillsides, often with severe slopes that mandate hand-cultivation and harvest. Yield and vinification are tightly controlled, and the effervescence is produced not by the individual-bottle Champagne method but by a modernized version of the Charmat method. 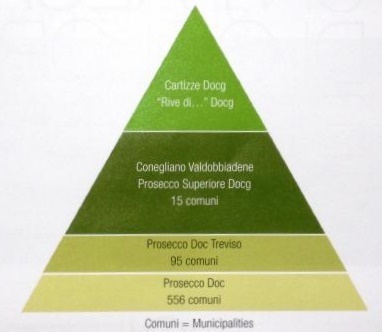 The larger volumes permitted by that procedure contribute significantly to keeping Prosecco’s prices substantially below Champagne’s. Aside from the fact that they’re both sparkling wines, comparing Champagne and Prosecco is a case of apples vs. oranges. They are two completely different entities. Champagne, for all its festive associations, is often austere, its fruit secondary to its minerality and structure. I’ve never yet tasted an austere Prosecco, nor do I ever hope to: It tends to softness, a gentle fruit-forwardness, seductive rather than confrontational, with some minerality after, and plenty of structure if you look for it. But Prosecco doesn’t demand you look for anything, just that you enjoy what’s in your mouth. If ever a wine says “Like me!” it’s Prosecco.